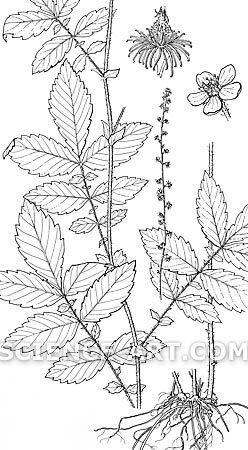 "Flora of North America: Agrimonia gryposepala"
Copyright © 2006 Flora of North America. This image is available for reuse purchase. Marjorie Leggitt DescriptionPen and ink. Reference material: herbarium specimens, use a stereomicroscope for details. Illustrations are critically reviewed three times by authors and taxom editors for physiological and taxonomic accuracy before inking the final "plate". Client: Flora of North America, Misoouri Botanic Gardens.